Vinyl Stickers is rated 4.2 out of 5 by 16. Print durable vinyl stickers that withstand outdoor exposure. Rated 5 out of 5 by Bobby from Great job as always got it done on time. Wished they could cut them at a reasonable price. Rated 5 out of 5 by Mraj from Great Great stickers. Good quality. Came in handy. Recommend. 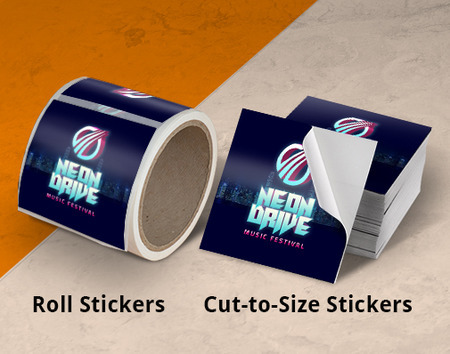 Vinyl sticker printing is a staple of branded outdoor promotions and custom product packaging. This popular marketing tool is placed on walls, windows, food and drink containers, and shipped boxes. 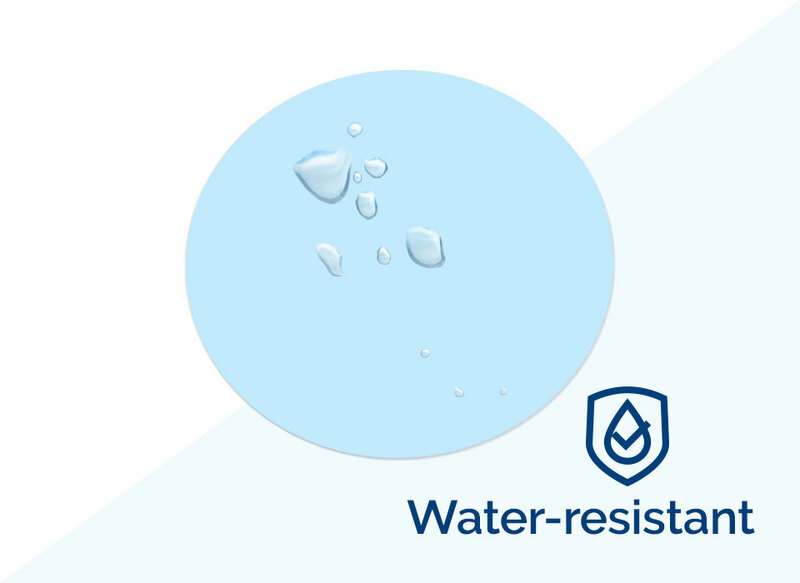 The material can withstand outdoor elements such as water and weather. Roll With It or Make the Cut? We offer two kinds of vinyl stickers. Your choice will depend on how you’ll be applying and distributing this sticky material. Both cut-to-size and roll vinyl come with an easy-to-peel backing. Both sticker types can be printed in square, rectangle, circle or oval shapes. Each shape comes with a wide selection of sizes. Roll vinyl sticker designs in square or rectangle come with rounded corners. You can also create a custom shape and size for a roll vinyl sticker order. Ready to print vinyl stickers today? Our print experts are available for any specific questions or clarifications. When should I order a cut-to-size or roll sticker? Cut-to-size stickers are ordered for hand-applied labels or as promotional giveaways. Ideal for low quantity orders that start at 25 pieces. Each sticker comes with a crack and peel liner for easy removal and application. Roll stickers: start at 250+ pieces. It is usually for product label and business logo sticker designs. Each roll fits in a label dispenser, allowing for faster machine application. Am I required to indicate the unwind direction of the roll sticker? The unwind direction must be specified for machine applied roll stickers. This is the direction in which the sticker will be dispensed from the roll. 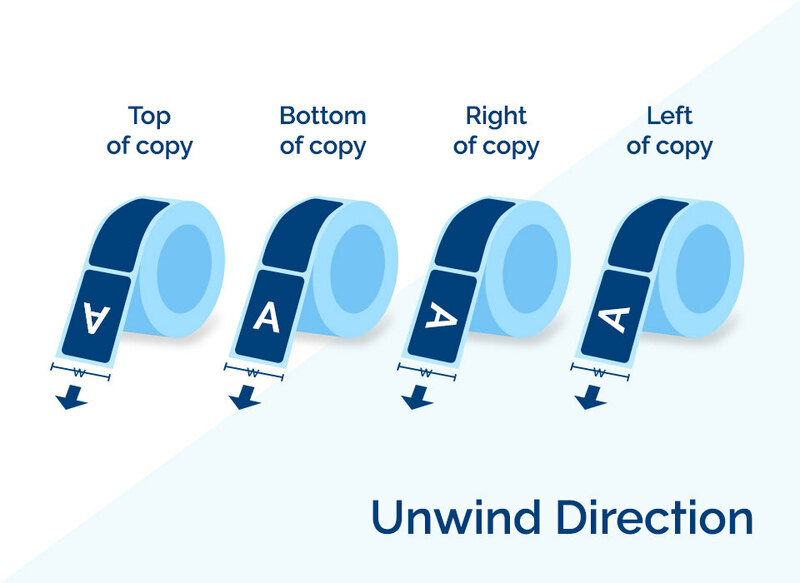 The listed options are based on the copy’s direction from the dispensing edge, as seen in the image below. Select “not important” if this does not affect your product. Do you guys offer wall decals or vinyl lettering for custom sticker shapes? For custom orders, we print one solid shape as the background for easier application. We do not print vinyl lettering or individual letters in a sticker. Yes, the white vinyl material is waterproof. It is our most durable sticker material. 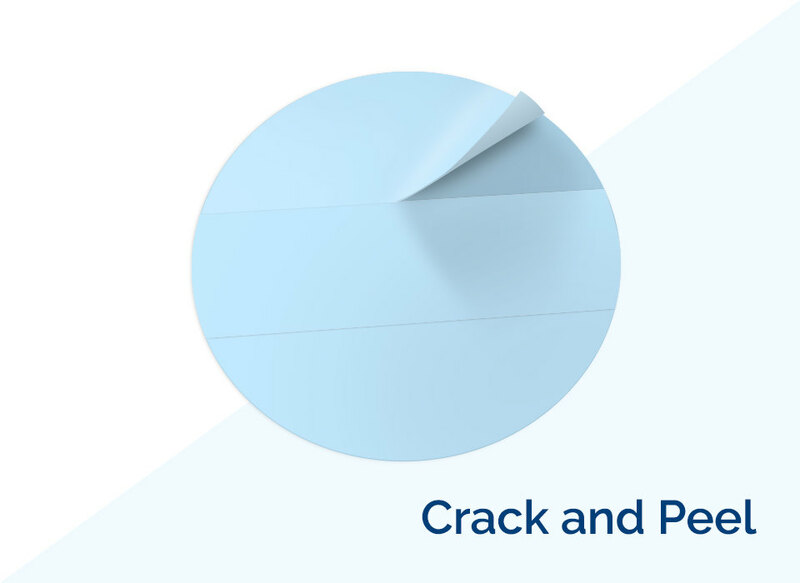 The white vinyl for roll stickers can withstand a -65° to 200° F temperature range. How long will it take to produce my vinyl sticker printing order? Cut-to-size stickers can be ready in 1 business day. Roll stickers take 3 business days to produce. The printing turnaround refers to the number of days for printing the order. Select “Get Shipping Estimate” and input your ZIP code to find out when the vinyl stickers will arrive. Use our vinyl sticker layout templates to ensure your artwork and designs are sized and formatted correctly. PrintPlace layout templates can be downloaded for each vinyl sticker size below, in an EPS, PDF, or JPG format for Illustrator or Photoshop. Have a stash of promotional stickers. A vinyl sticker of your logo or company name provides high brand retention at a low cost-per-impression rate. Include a cut-to-size sticker with every customer sale or give them away for free at an event. Choose a sticky shape. By sticky, we mean a memorable shape that also still defines your brand. Don't be afraid to customize the sticker's form so that you always stand out from the competition. Simpler is better. An understated, minimalist design can keep the attention on your branding element. Stick to two or a few colors so that customers immediately see the name or logo of your company. Cut to Size: To apply the vinyl sticker, each cut-to-size piece comes with scoring at the back for easy peeling. Roll: Roll stickers can either be applied manually or using a label dispenser. We recommend the latter as it ensures a faster and more efficient application for large quantities. Need inspiration? Check out how this coffee shop used promotional stickers or how vinyl stickers serve as an irreplaceable marketing tool for schools.